Most of our audio clips use Windows Media Format (WMA); please make sure you have the latest Windows Media Player installed. Note that there is a version for the Mac, and you must install it to hear our files. Windows Media Player can be obtained for free from Microsoft here. To test your ability to play WMA files, click here. If you cannot hear this file, then you'll have to address a problem with your computer configuration; this website is not at fault. If you can hear the WMA file, and are still having problems, then please click here to experiment with the audio settings in the site control panel (your browser must have cookies enabled to use this feature). In the control panel, select "External" for the Audio Link Method, and then click Sumbit Changes at the bottom of the control panel page. The newest set of sounds (May 2007) on this site were encoded with the Windows Media 9 Speech codec and there seems to be a problem with playback on older installations of Media Player. If you are having this problem, please contact me so I can assess its extent. Please send me the Thai for [word]. I want to get it tattooed. This is the most common e-mail request that I get. I am not a Thai native so you wouldn't want to trust my limited knowledge for something as permanent as a tattoo. Although I have good confidence in the accuracy of the 30,000+ entries in the thai-language.com dictionary and it is constantly improving, I cannot be responsible for errors that appear on this site and you should consult additional, expert sources before tattooing anything you find here. I will not respond to e-mailed tattoo inquiries. You may wish to post your translation request on this site's message board, where some of our native Thai members may assist you. Although there are great copy artists out there, it only makes sense for Thai writing to be inked by a native Thai artist, don't you think? Be sure to consider all your options; for example, instead of Thai text, you might prefer an image in a Thai style. 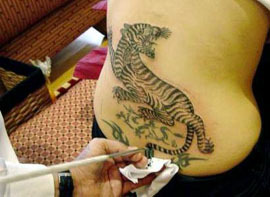 Consult with a Thai tattoo artist about this. What a great excuse for a trip to Thailand! If you have a word, phrase, or name you'd like to see represented in Thai script, you must first decide if you want it translated, written in phonemic transcription or (for certain names) as a transcription pun. If the word or phrase you wish to render has a meaning, you can use a translation. Search for the word in our online dictionary. So for example, lion could be represented as สิงโต /singR dto:hM/, because that is the Thai word for "lion." Please keep in mind that often, a literal or "word for word" translation of a saying or motto from English to Thai will end up completely out of context or nonsensical in Thai. We've all seen those Japanese T-shirts with gibberish English on them—well the reverse situation is just as likely if you translate word by word. Cultural differences can be vast, so check your final translation with a native Thai to be sure it actually makes sense. For example, my name Glenn happens to have a fairly accurate representation in Thai; เกล็น would be pronounced /glen/ by a Thai person. This is my good luck that the consonant cluster กล corresponding to the "gl" sound is valid for the beginning of a syllable in Thai. The word milk, however, has no good phonemic transcription, because there is no syllable-ending "lk" sound in Thai. If a Thai person were to say this word it would come out sounding like "mew," the utterance of a small kitten. You can browse the names category to get an idea of how foreign names might be pronounced "in Thai," which is to say, by a native Thai person. Compare the name to the phonemic approximation shown, or listen to the native Thai speaker on the audio clip, if available. Many names are sound fairly close to your native language, while a few are hardly recognizable. Since transcriptions are inherently approximate, there may be several possible transcriptions of your phrase for you to choose from. Some may use different Thai letters (technically, "graphemes") and some may sound slightly different when spoken. Be sure to investigate these options. For example, if you are presented with a choice of different letters, you may wish to research the letters' unique histories and associations—personalities, if you will. The use of the การันต์ /gaaM ranM/ is also highly variable in transcriptions. The lexical tone of a Thai word (rising, falling, high, low, or mid) is determined by the spelling so you have a choice here too and you'll want to pay attention to this detail. There is a standard procedure for transcribing English words into Thai, and we are pleased to offer a translation of this official document: Rules for Transcribing English Words (into Thai). Be sure to check out the two tables referenced at the top of the document. Finally, there are many styles of Thai writing to choose from for your tattoo. You can browse a selection of writing styles here. How do I write my name in Thai? Check the names category for a list of common English names. If your name is not listed, ask on the message board. If your message is answered there, then it will probably also be added to the category. If your name is not a common one then you should also provide an idea of how it is pronounced, perhaps by supplying well-known word that rhymes (be careful of rhyme words that have British versus American pronunciations), or posting an audio clip of yourself saying it. There is more information about transcribing a name into Thai in the section immediately above this on tattoos. Can I use your dictionary to send e-mail or correspondence in Thai? How can I get a letter translated? Microsoft Bing and Google both offer automatic translation between Thai and English. These sites use statistical machine translation to provide approximate translations, but please be aware that statistical machine translation is an area of much research and the results for languages like Thai suffer from a shortage of training sources. We are far from the point where machine translation can replace the services of a professional human translator. If you have a letter entered as Thai text in your computer, our bulk lookup page might help you piece together a rough translation. Where can I study Thai? Check Where To Take Thai Classes on the message board to look for classes or post your inquiry. The phonemic transcription system used throughout this website is explained here. In some cases, the programatically-generated transcription is not correct due to inadequacies of our algorithm. Like most languages, Thai has many irregularities which have not yet been tagged in our database. Furthermore, some of the pronunciation rules are not codified in our algorithm. For entries with audio pronounciation, the audio gives the correct pronounciation in any case where there is a difference with the romanization. Please feel welcome to submit corrections to erroneous romanizations by using the correction link at the bottom of every dictionary page. However, please realize that romanization accuracy is a goal which is secondary to our other development activities, such as recording additional new audio clips. Most users agree with the prioritizations we have set. We have several ways that we correct transcriptions in our system: syllabification assistance; so-called xlit flags which tag certain prescribed situations; manual override entry; and modifications to the C++ source code for the engine. If your correction can be accomplished within one of the easier of these modes, it has a better chance of being effected in a timely manner. We encourage all students of the Thai langauge, even beginners, to try to learn reading Thai script. Our philosophy with regard to phonemic transcriptions is that they are a low-priority, provided as additional assistance with the caveat that many are incorrect. In fact, the earlier versions of this site did not have transcription. We added the feature only when our users indicated that a crude offering (such as we now have) is better than having no romanization at all. A top priority is on having the correct Thai script (spelling), and we will immediately fix any reported misspellings in Thai script. What is "phonemic transcription?" What's the difference between "phonemic" and "phonetic?" The writing systems of nearly all languages are considered "phonemic" because they do not—without calling upon supplemental cultural background information—specify the exact acoustic properties of the sounds of the language. The native alphabet of a language generally only needs to differentiate amongst its phonemes, or the set of sounds which are meaningful in that language. A true "phonetic" written representation of ethnological speech may not, in fact, be possible; the International Phonetic Alphabet (IPA) aspires to this lofty ambition and is the most developed effort in this regard. As a general example, phonemic transcription is the process of writing a Thai word with the English alphabet, or writing an English word with the Thai alphabet. In some pedagogies, the availability of such transcriptions is believed to help the beginning student of a foreign language become acclimated. However, we caution against the overuse of phonemic transcription for reasons outlined here. Some sources use the term "transliteration," instead of "phonemic transcription," but this is technically incorrect as the former refers to a system that maps the writing of one language directly to the writing of another without consideration for the phonetics or phonemics of either language. Can I buy this site on a CD? Due to contractual agreements regarding some of the data sources that we use, I'm sorry that we cannot release it on CD at this time. Also, our current server technology is not designed with a CD in mind. Developing for dual platforms (Internet and CD) would strain the resources of this effort—remember, this free site is created and maintained with donations and by volunteers. Additionally, when you use the site live on the Internet, you always see our latest data. A CD snapshot of our data would not benefit from the many corrections and enhancements that we are constantly uploading. The database was last updated 2.61 days ago. Of course, the CD product could be updatable, but this would be yet another sizable design and development effort. click here for Bryan's suggestions. November to February has the most pleasant weather. If you'll be traveling during Thai national holidays, make sure to book well in advance, since Thai domestic tourists fill up the resort areas during these times. Also watch out for Songkran, the Thai New Year, which is in mid-April. May through August is very hot and muggy, so many foreigners stay away. If you don't mind the heat and appreciate good walk-in rates at hotels, you may want to travel during this time. Are there other computer-based learning programs for Thai language? I recommend the Thai Interactive Learning System CD-ROM from Courage Software. New version 2 released in 2004. Also check out the links page for links to additional Thai-language web sites. Please check our phrases section, or search for the phrase in the online dictionary. Also, Letter from a Thai girlfriend. The Thai characters don't show up properly. This web site uses the language auto-select mechanism in your web browser. If you are using a compliant browser, the Thai character support should automatically install when you first visit thai-language.com. If there is a problem, go to the "View" menu, and check the "Encoding" to ensure that its on "Auto-Select," or manually select the "Thai - Windows (874)" encoding. In order to use Thai characters on your computer, you should understand a bit about character encoding. Computers represent alphabetic characters (text) using numbers, one for each letter. The most common way to do this is the system called ASCII. Officially, ASCII uses seven bits (a bit is simply zero or one) of memory to represent the upper- and lower-case letters from A-Z, digits from 0-9, and various symbols and punctuation marks. With seven bits, 27, which equals 128 possible characters can be represented. Computers process and store eight-bit chunks of data called bytes. With one byte (eight bits) of memory, 28, which equals 256 possible characters can be represented, so beyond the 128 ASCII characters, another additional 128 characters are available. A system called ANSI uses these extra characters to represent western characters with diacritical marks (various types of accents). Before Windows supported Unicode, this was the only way to represent Thai on a computer. You would have to install a TIS-620 font (such as "DB ThaiText") and it was your responsibility to make sure that this font was selected whenever you wanted to display Thai. Essentially, it was the end user's responsibility to coordinate things, which isn't a very user-friendly paradigm. Unicode is a system for using two bytes (16 bits) of memory to represent each character. With this system, 216, or 65536, characters can be represented. With Unicode, the Thai letters do not need to share their assignments with any other characters (such as accented characters) and you can easily mix characters from many languages in a single document with no fuss. You can copy-paste text between programs with no problems. Although a Unicode text file may be twice as big as an ANSI text file, this is a small price to pay for not having to worry about which character set is used where. All the latest versions of Windows support Unicode (the older Windows 98 has partial support for Unicode in order to allow the Internet Explorer browser to work). Text displayed in the Internet Explorer browser is always ultimately displayed in Unicode, even if the underlying web page is authored with an 8-bit character set such as TIS-620 (which is usually the case, in order to save on download time). The browser converts from the eight-bit character set to Unicode using a mapping specified by the <meta> directive hidden at the top of the web page (and/or the encoding hidden in the web page's HTTP header). These hidden directives are specified by the web site author. These days, you should not have to install or worry about an old TIS-620 font. Your best bet is to use an up-to-date operating system and install the Thai input locale and Thai support using the control panel's Regional and Language Options settings. On the Languages tab, check "Install files for complex script". Then click the "Details..." button and add the Thai Kedmanee input support. Now you can switch between English and Thai typing by selecting near the tray area of your screen. There are some illustrated instructions here. ...However, problems can occur when you try to copy-paste TIS-620 text (from certain types of email, or certain old Thai applications) into modern Unicode applications. That's because the Windows clipboard (which stores the text temporarily during the copy/paste operation) has no way to store the following fact: "the current (text) contents require/presume the TIS-620 character mapping" (re-read the previous sentence if neccessary). So, when the receiving application converts the 8-bit text to Unicode, it uses a default character mapping, which renders Thai characters as various accented Roman characters. The best solution to this problem is to not start with TIS-620 text in the first place. If this is impossible because the source of the text is beyond your control, then you have two choices. 1.) convert the text to Unicdoe explicitly using my crude converter program. or 2.) keep the text as 8-bit TIS-620 in the target application, and manually apply a TIS-620 font (DBTT) to it. Modern operating systems which support alternate input locales, do not support creating 8-bit text with a TIS-620 mapping. If you still feel like you need to do this, you can use our "Crude Thai typing program". How do I create a webpage in Thai? If you want to display Thai on a web page, you have three choices for encoding your HTML file: TIS-620, Unicode UTF-8, or Unicode UTF-16. Most editors, including Windows "notepad.exe" allow you to use any one of these. TIS-620, as discussed above, is a convention for representing the Thai characters in the upper half of an 8-bit (1 byte) character space. This is the system used by thai-language.com. The advantage of this choice is that the HTML file size is smaller, since each character uses only 1 byte, and smaller HTML files consume less bandwidth, transmitting faster. One disadvantage is that many accented roman alphabet glyphs are only available through an HTML escape sequence, such as &eacute; for é. Another disadvantage of using TIS-620 to author a web page with Thai is that it may be a nuisance to get the Thai to display in your editor. For this, you can either manually select a TIS-620 font for display, or use an editor that supports selecting the character encoding. Microsoft Visual Studio source editor is one such editor. When using the Visual Studio editor with an encoding, your file is edited in Unicode mode and converted back to TIS-620 upon saving. If you choose one of the Unicode formats, you shouldn't have to worry about these tags. UTF-8 if self-identifying since files start with the Byte Order Mark EF BB BF, and UTF-16 uses BOM of FF FE (or FE FF, click here for details). A Unicode editor should display everything properly with fewer hassles, assuming your Unicode font contains the glyphs for the language(s) you're using. UTF-8 is an 8-bit stream that is able to "escape" out for extended characters; it's a good choice for documents which consist of mostly Roman characters with a sprinkling of extended alphabets. UTF-16 will use 16 bits for every character, which can double the size of an HTML file. Use it when your page has many languages used in roughly equal parts. There are two recommended ways to author a web page in Thai (and numerous not-recommended ones). Use Unicode to write a mixture of Thai, English, and other language characters in your HTML file and then save it as a Unicode text file, using a Unicode text format, such as UTF-8 or UTF-16. If you are using Windows 2000/XP, the notepad accessory program is Unicode-aware, so there are appropriate options in the "save..." dialog box. This method has the advantage that you can see both the Thai and English properly when editing the raw HTML. However, the HTML file may be larger (and thus take longer to transmit), particularly if you select UTF-16. This concern can be mitigated by enabling compression in your web server software. Most browsers do not require this HTTP header information to be present, however; the <head> block code appears to be the essential ingredient. How do I send e-mail in Thai? To type an e-mail in Thai, install the Thai input locale as shown here. With most modern standalone mail programs you can select the desired message encoding from a menu—i.e. "Thai (Windows)" for 8-bit transmission or "Unicode" for 16-bit. Note that you're actually always typing your e-mail in Unicode (with keyboard/input support being provided by the operating system), and the mapping to 8-bit (if desired) is performed for transmission. If for some reason you really must use TIS-620 to compose the message, then you'll have to use to another method for typing, such as my simple Thai typing program. As of this writing (February 2005) I could not get Hotmail to work properly. It semms to send an 8-bit message, but does not insert the character set header, so it may be difficult to convince a receiving program (such as Outlook) to interpret the 8-bit stream as using one of the 8-bit Thai encodings. We now offer an online utility that can fix many such problems. Click here to give it a try. If you wish to know why misencoded text happens, read on. it requires the mail originator (you) to get involved with specifying which encoding the email program should use. If you receive such a message—a message that's supposed to be in Thai but looks like garbage characters—you can try manually switching the "Encoding." How to do this depends on the email program you're using. For Microsoft Outlook 2007, the Encoding option is on the "Other Actions" menu for the message. For web-based email such as Hotmail, try switching the page encoding under Internet Explorer's "Page" menu. If your email program still won't interpret it as Thai, you might be able to manually apply the 'DB ThaiText' font to the message or web page. To address the problems with TIS-620 mail, many mail programs elect to send Unicode (16-bit) mail. They wrap up a block of Unicode and make it suitable for transfer. Behind-the-scenes, this is a more complicated system, but one which hopes to make the whole process easier for the user. It requires the mail receiving program to be able to deal with the elaborate "mime" schemes that were used to package the message, so your message may not be readable by some recipients. If none of these methods enable you to see the message, then download my XTIS620 program and copy/paste the garbage text into the program. For this program to work, you'll have to have the DBTT.TTF font installed. See here for details. The online dictionary at www.thai-language.com has been designed from the ground up as an Internet application. Although you could possibly use a site-ripper or leacher program to copy the whole site, the search function wouldn't work any more if you did this (browsing might still work). That's because the search is dynamically processed by our servers, and includes searching on "hidden" keywords which are never exposed on the web. Also, we're constantly adding new words and corrections to the dictionary, so you'd miss out on these. The site was last updated 2.61 days ago. Our priority is to support interactive online users. Site-ripping software sometimes consumes too much of our bandwidth, inhibiting interactive users from using the site effectively. If this is happening, we may occasionally disable your site ripper or your IP address from accessing our site. This is usually temporary and you can regain access a few hours later. Please click here to see a comprehensive overview of using Thai on the Macintosh, posted by one of our users on the message boards. This web site is tested with the latest Microsoft Internet Explorer and Firefox web browsers. I do not test with Opera or other browsers, or on other platforms such as Linux, Mac, or iPhone. I apologize that I don't have the resources to test with these other platforms. If you have a specific request for how this site's HTML could better support another platform, please send it to me and I will do my best to incorporate it. Requests of this nature must include details of exact HTML which is proposed to be changed, and in what cases. How can I type (using the standard Thai keyboard layout) in Thai on my computer? If you use Windows 2000/XP, go to the Control Panel/Regional Options, and select the "Input Locales" section. From here you can add the Thai keyboard and configure a hot key for switching between multiple input languages. If you are using an different Windows product, try one of my "Crude Thai Typewriter" programs. To use these, you'll have to install the DBTT.TTF font first. The first program, ThaiNP.exe is just an edit control which remaps your keyboard for the Thai layout. Click here for a color-coded image of the standard Thai keyboard layout. You can print this out and refer to it when using the ThaiNP program. How can I get on the Internet while I'm traveling in Thailand? There are numerous "Internet cafes" available throughout the country and in every major city where you can surf for a very reasonable hourly rate. If you will be spending a lot of time in Thailand with a laptop computer, you may prefer to get your own month-to-month dial-up service. It can be arranged through KSC with a recurring charge to your credit card. Send in the application a couple weeks before you arrive in Thailand so the service will be activated by the time you arrive. I hear the roads are dangerous in Thailand. Will my trip be safe? Road travel in Thailand is dangerous. Annual traffic fatalities for 2013 were about 26,000. Reputable tour companies escorting foreigners will use safe drivers and equipment, but these precautions cannot always account for the other drivers on the road. However, this should not discourage a trip to Thailand. Heightened awareness of the issue may be enough to protect your family. If you are on a bus that is driving unsafely, ask the driver to drive more carefully or ask to be let out. Most fataility accidents in Bangkok involve motorcycles. If you are still concerned, consider using domestic air travel within Thailand or long-distance trains to get around rather than roads—this may ease your mind a bit.